In this final substantive chapter, we turn our attention to southern Africa and, more particularly, the cases of Lesotho and Swaziland — two tiny, landlocked countries almost entirely surrounded by South Africa (entirely so in the case of Lesotho), regularly cited as among those most highly exposed to preference erosion. 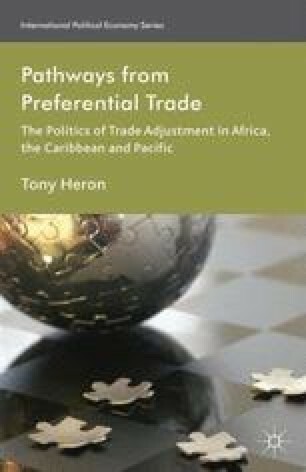 Whereas Chapters 3 and 4 focused exclusively on EU trade preferences, the main point of reference here is the United States, specifically its AGOA trade programme. This has operated since 2000 and is often compared favourably to the EU’s more elaborate system of trade preferences, especially with regard to AGOA’s more flexible rules of origin affecting textiles and clothing exports. In this vein, Peter Gibbon (2003: 1809) has described AGOA as the ‘most far reaching initiative both in the history of US-African relations, and more generally in relation to the claim that concessions in the area of trade provide better long-term prospects for developing countries’ economic development than do ones in aid’. In the first two years of AGOA’s existence, the five leading African exporters of textiles and clothing — Kenya, Lesotho, Madagascar, Mauritius and South Africa — increased their exports to the United States by a reported 85.3 per cent (Gibbon 2003).